"A brilliantly fun and informative read. Dominic Selwood has taken the juiciest bits of history from the past two thousand years and put them together in one marvellous volume. Selwood is a rare blend of insightful historian and thrilling writer. Cracking along at a breakneck pace reminiscent of Dan Brown, Spies, Sadists and Sorcerers is as perfect for the beach as it is for serious historical background reading." "Dominic Selwood dives into the most fascinating (and controversial) historical topics and succeeds in bringing fresh insights and stringent clarity to some of the most baffling mysteries of the last 2,000 years, often overturning conventional wisdom. This book made me wince, laugh, groan and cheer. It's a fantastic read for any lover of history." "In an intriguing collection of essays, Spies, Sadists and Sorcerers dares to break rank and expose lies, debunk myths and set the record straight about English history from Roman times to the present day." 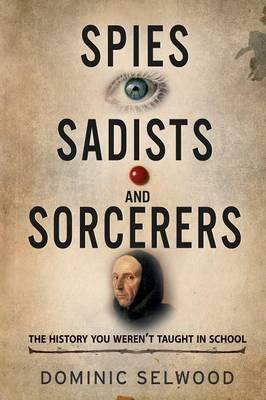 Spies, Sadists and Sorcerers unveils the history you were never taught in school. With a breathtaking sweep spanning Rome to the modern day, popular historian and author Dominic Selwood challenges the traditional version of some of the best-known events of the past. From ancient Christianity to the voyages of Columbus, and from the medieval Crusades to ISIS and the modern Middle East, this book debunks dozens of historical myths. ... and lots more. This book will challenge everything you think you know about history!